«©NCSX» Lengthen the cord of a 3DO controller with this handy cable extender which adds 6 feet of space between you and the television. As an added bonus, the cables are also compatible with Mega Drive and Atari 2600/7800 systems. Please note the cables are new but the boxes have dings, dents, and other imperfections caused by years in storage and warehouse to warehouse transportation. 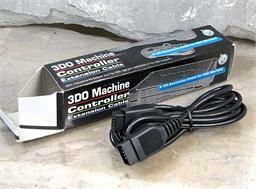 The full name is 3DO Machine Controller Extension Cable.